World Snooker referee Ben Williams will be taking charge of his first ranking final tonight in the Kaspersky Riga Masters, and we caught up with him in ahead of his biggest match to date. It’s incredible. I’ve waited a long time for this! Twelve years as an official and I get to referee my first ranking final in a beautiful place like this, it doesn’t get any better. You’ve been a regular face on the tour for a while now, working behind the scenes at tournaments as well as refereeing, but tell us a little bit about yourself – how did you get into the sport? It got into referring properly about 20 years ago. My local team captain Mick Davenport was a referee himself, and one day he introduced me to that side of that game. I started off refereeing amateur matches for about 4 years, before I was asked by World Snooker to work at one of the qualifying events. I loved doing it, but I never thought I would get to this stage in my refereeing career. It really is what dreams are made of. What are your earliest memories of the game? For me, it was watching Jimmy White and Steve Davis on TV when I was a kid in the ‘80s. The characters that came from that era, the flair, I just loved every second of watching those guys play. I’ve got to say, refereeing the World Seniors final on TV was pretty special. After that, I refereed a great one between Shaun Murphy and Mark Allen in the semi finals of the Players Championship when it was in Manchester. That was my first ranking semi final, and it was such a great match. But of course, tonight has to top that. I can’t wait. 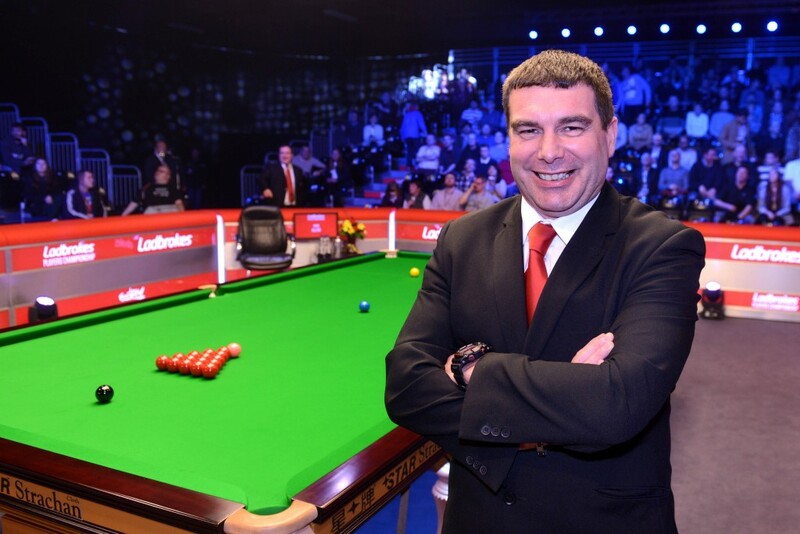 What’s the best thing about being a referee on the World Snooker Tour? To be honest I think it’s all the banter we have! I’ve made a lot of friends on tour, wether it’s the other referees, tournament staff or people we meet along the way . We have a great laugh and a lot of fun off the table. But of course, there’s the serious side, and the likes of Jan Verhaas and Brendan Moore have done a lot for me in the lead up to this. You couldn’t ask for better people to work with. What’s next? What are your ambitions in snooker? More finals! The Crucible has always been my target. I’ve always wanted to referee there – every referee does. But what I’ve achieved so far is more than I ever expected. I keep having to reset my targets! Looking ahead to tonight, how are you feeling? Any pre-match rituals to go through? You know what? I’m pretty calm. I’m just going to take it as it comes and enjoy every second of it.